I call this the Steel Siren. My materials were all cut, poked, pulled, bent into shape. It was my first, it is my favorite. Metal is a great medium to work with in fashion because of its reflective properties. The high contrast between lights and darks in addition to a smooth gradient draws me to this sharp material. The wardrobe is not photo shopped, it is real. This piece came to me from a similar design I saw on a canvas. The piece is a futuristic metal dress accented by black lines aka electrical tape. 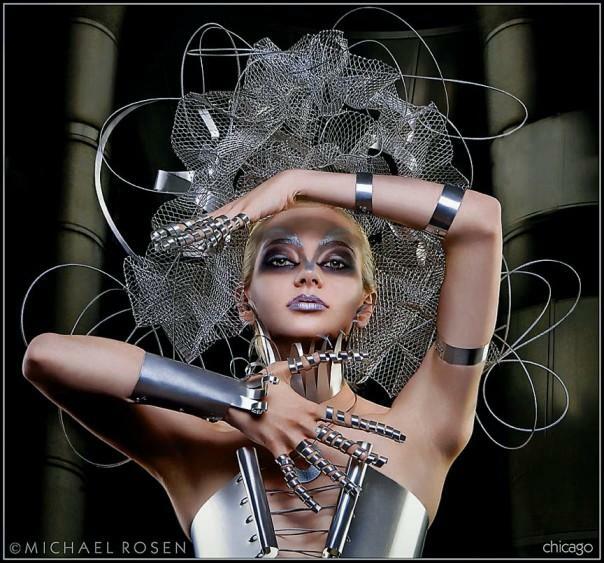 It was designed for a workshop with two great photographers: Michael Rosen (Chicago) and Tony Tang (Ireland). All the metal dresses were designed by myself, Jennifer Lynn. I currently reside in San Francisco. I love alternative mediums and wearable art! I’m currently in awe of your creations. In the previous post, the one about the flower wall, I saw that we have a few things in common: we love Michaels and Home Depot haha! The first image featured in this post is stunning, and I’ve always had an affinity for metallic or chrome textures. Can’t wait to work with you sometime soon.